Long before the current wave of superhero movies, there was The Rocketeer, a 1991 live-action Disney flick inspired by golden age comic tropes and pulp fiction. With the interest in comic book movies at an all-time high, it has been long seen as ripe for a revival or reboot. There were rumblings for a number of years of a new movie, but it struggled to- if you'll excuse the pun- get off the ground. Now it seems that the franchise is to return in an unexpected form. : an animated series. The new animated series will be aimed at a young audience (and their families) and is set to arrive on Disney Junior next year. receives a surprise package on her birthday revealing she’s next in line to become the Rocketeer, a legendary superhero who has the ability to fly with the help of a rocket-powered jet pack. Armed with her cool new gear and secret identity, Kit is ready to take flight and save the day with her gadget-minded best friend, Tesh, and airplane mechanic uncle, Ambrose, who join her on her epic adventures. 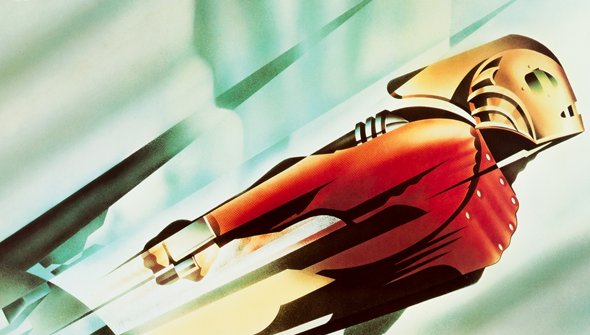 The idea of a Rocketeer with a female lead was being touted for a while as a live-action movie. Somewhere along the line though, it seems to have turned into this series. With Disney Junior being the ultimate destination, many older fans may be feeling a little disappointed. The franchise would lend itself beautifully to a Batman The Animated Series style show. That being said, Disney are intending it to introduce the franchise to a new generation... so if successful, we may well see more Rocketeer shows or films on the way. The Rocketeer is in production now and is expected to debut some time in 2019.